Now that a lot of people are a few weeks into their fitness resolutions I have started getting a lot of questions about diet and what to eat to lose weight. There was a couple guys in the gym asking if i know and nutritionists that I would recommend. This led to an in depth conversation about nutritionists and dietitians and the difference between the two. There are some differences. Many trainers have a preference for one over the other. Some people even go to bash the other profession. For the most part I don’t beleave that either is nutritionist or a dietitian is better or worse or would ever give anyone bad advice on purpose. The opinion of a nutritionist and a dietitian may be the same or it may be different it really all comes down to education and beliefs. Some will get in heated arguments with you on who’s advice you should follow. Personally I am not a dietitian. The minor I took in university was nutrition so I have a very strong background in the Science of nutrition. I could call myself a nutritionist because there are no regulations on what education you need to be called a nutritionist and that is where the difference lies. In Canada the terms ‘Dietitian’ and ‘Registered Dietitian’ are protected professional titles. Each province has an independent professional college which is responsible for protecting the public and regulating the profession. The collages investigate malpractice or reports of negligence, make sure all the dietitians are following their scope of practice. Basically they have a governing body that keeps them accountable. To practice as a registered dietitian within a province, a dietitian must register with the college and obtain a license. The activities of the college are governed by legislation passed by the provincial government. It is the presence of this regulatory body which distinguishes registered dietitians from nutritionists in Canada, the regulations for which vary by province. The colleges also set the minimum entry requirements for admission into practice as a registered dietitian. Requirements include a four year undergraduate degree from an accredited university (which includes courses in science, foods, nutrition, management, communication and psychology/sociology, among others), a 10-12 month supervised practice period, and successfully passing a board exam in nutrition and dietetics. Many dietitians work in clinical settings like hospitals and retirement residences. In most provinces the term nutritionist is not protected. meaning that anyone can call them self a nutritionist even it they are self taught in their field of nutrition. If they are self taught and not accountable to anyone they can say, prescribe and recommend anything they want to their clients without consequence. Again I don’t think that anyone is out to give anyone bad advice on purpose. Dr. Oz recently got into trouble for recommending products that were not scientifically based. He was pulled in front of a senate committee hearing to answer questions. 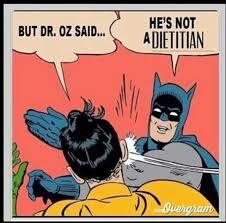 Dr. Oz is not a Dietitian Yes he is a Doctor, a cardiologist. He went to school for a long time and is really smart but didn’t spend 4 years studying nutrition. I’m sure he learnd a bit about nutrition but even he got his hand slapped for this one. He doesn’t look super happy being there. He is not trying to do any harm to people, quite the opposite. As a cardiologist he keeps up on what’s new in that field to keep his medical licence. Just like my account keeps up with new tax laws so he can keep his chartered accountant designation. Nutritionists keep up with the new research in nutrition. Nutritionists may or may not keep up with what is new. The title “nutritionist” is protected by provincial law in Quebec ,and Nova Scotia. The term “Registered Nutritionist” is protected in Alberta . The term “Registered Dietitian/Nutritionist” is protected by law in New Brunswick. Nutritionists want to give people good advice, they may not agree with dietitians or maybe they do they just don’t want to go to school for 4 years. Some Nutritionists are “Certified Nutritionists” which is a good start because they have some certifying body. They passed some test and hopefully need to keep up with what is relevant in the industry and get some ny professional development credits from attending conferences and or workshops every year. It may seems like I picked on nutritionists a bit here. 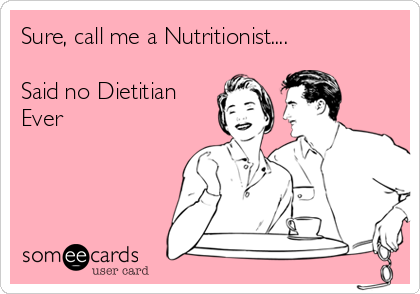 I know a lot of nutritionists and dietitians and enjoy working with them both. I even know some nutritionists that have their 4 year degrees in nutrition along with their masters yet choose to not register as a dietitian. When choosing take several things into account. Do some research and ask some questions. 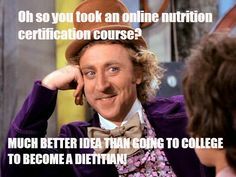 If it is a nutritionist or dietitian ask for credencial, look for or at their certification. Ask them how they keep up with what is new in the nutrition industry. Ask for references or testimonials from other clients. Ask what there beliefs are and see if the line up with yours, are pro supplements, cleanses, no wheat, no dairy, and elimination diets. Good ones will say that nutrition is very individualized with many factors coming into play. If you have a medical condition check to see if they have worked with other clients with that same condition and what the success rate is. And is working with someone with that condition within their scope of practice. Nutrition as well as personal training are two professions that are very young and continue to grow. We are learning new things every day in these fields. Be sure whoever you choose that they are keeping current and informed.